A drug-free and clinically-proven treatment for ADHD and ADD with a 90% success rate. Neurofeedback Therapy is an effective treatment for ADHD. Case studies have shown that neurofeedback therapy is a successful treatment for up to 90% of ADHD patients who receive it. Neurofeedback reduces the symptoms of ADHD. ADHD patients exhibit irregular brainwave activity that can be measured by an EEG. More specifically, people with ADHD will produce excessively lower frequency Theta waves. Since the process of neurofeedback naturally retrains brainwaves to return to a balanced and normal state, ADHD patients can often find relief, relatively quickly (and sometimes permanently), through neurofeedback therapy. Children often see significant improvements with neurofeedback. There is a wide range of symptoms associated with ADHD that can vary based on the individual’s sensitivity to the two key behaviors (inattention and hyperactivity-impulsivity). 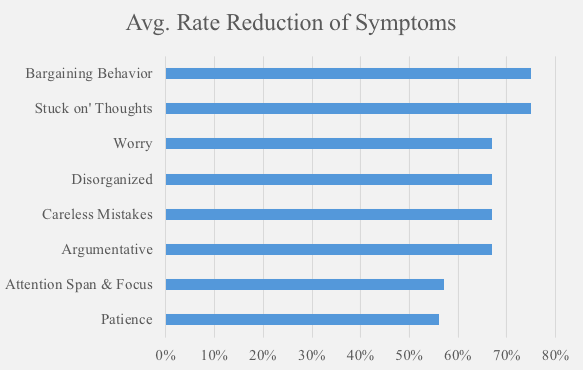 While some patients experience symptoms related to only one of the key behaviors, most show behavioral irregularities based on a combination of the two; the most common being restlessness, trouble concentrating and trouble controlling impulses. Neurofeedback is a safe alternative to ADHD medications. The Center for Disease Control (CDC) estimates that 11% of American children, ages, 4 to 17, have ADHD. According to their trends, this is a 42% increase in just 8 years. While the rate is much lower for adults (about 4% of the adult population has ADHD), experts caution that adults are much more likely to remain undiagnosed, and therefore the actual rate of ADHD in adults may be significantly higher than reported. Prescription medications are the most popular treatment for ADHD, and their use has been on the rise faster than the rates of ADHD themselves. Between 2008 and 2016, ADHD drug sales have increased by over 89%, or $8.5 billion dollars. This trend shows, in conjunction with the overall ADHD diagnostic trends, that despite the increased reliance on medications to treat ADHD, the cases continue to increase in all age populations. As the use of ADHD medications continues to rise, so too does the impact of the side-effects associated with them. Several studies have shown that up to 80% of patients who take ADHD medications experience some side-effects, and up to 35% of patients actually discontinue taking the medications due to the side-effects. Is Neurofeedback Therapy is a clinically proven treatment for ADHD? Yes, neurofeedback therapy is a clinically proven treatment for ADHD. There are many research studies that show positive support for neurofeedback as a treatment for ADHD. Please see a few examples below and don’t hesitate to contact MyBrainDr for additional information and studies. MyBrainDr successfully treats patients with ADHD/ADD with neurofeedback therapy in Cary, North Carolina. Click below to schedule your free consultation today!